You are welcome to use our calculators, including screenshots if necessary, in your work. However, please note the terms of our standard disclaimer before doing so. The format is: Name of Calculator. (Year, Month Day). Retrieved from [URL]. For example: Chi-Square Test Calculator. (2018, November 13). Retrieved from https://www.socscistatistics.com/tests/chisquare2/default2.aspx. For in text citations you can shorten to: (Website Name, Year). For example, (Social Science Statistics, 2018). The format is: Website Owner. Name of Calculator. Website Name. URL (accessed date). For example: Jeremy Stangroom. Chi-Square Test Calculator. Social Science Statistics. https://www.socscistatistics.com/tests/chisquare2/default2.aspx (accessed November 13, 2018). The format is: "Name of Calculator". Website Name, Publisher Name, URL. For example, Chi-Square Test Calculator. 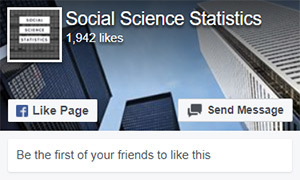 Social Science Statistics, Jeremy Stangroom, https://www.socscistatistics.com/tests/chisquare2/default2.aspx.